I am not a food blogger. I repeat, I am not a food blogger – but last week when I mentioned our Saturday night menu plans I promised a few people I’d share them. So here we go. This week is Henry Hotdog’s week. Each time G and I made a suggestion “Noooooo, it’s my week! You don’t get to decide.” Drunk with power. 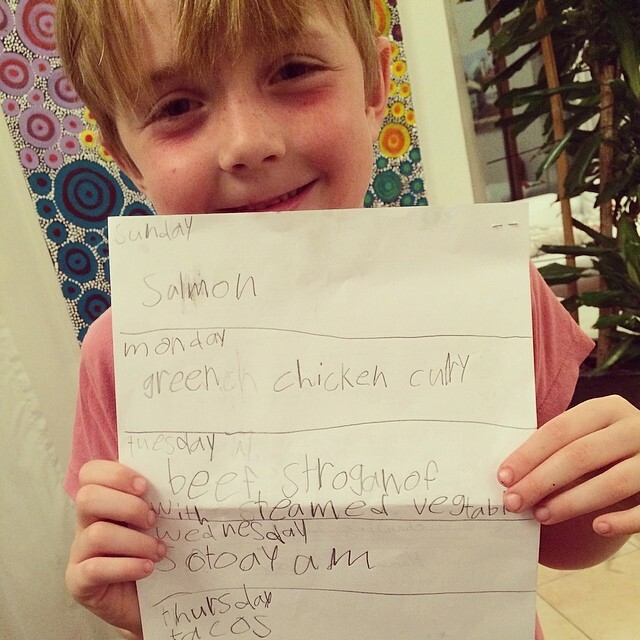 He kicked off the week with Salmon. Adults and the teen have salmon with an “Australian Bush Rub” which sounds a little like a wild evening with a bloke called Bruce in the Shearers quarters. We use a lemon myrtle rub from Illalangi, my sister lives in Waikerie (the home of Illalangi) and gave G and I a basket last year filled with their goodies. If you are anywhere near Waikerie they’re on the main road (just next to the petrol station and the bakery). Please, go there, try everything, you won’t be disappointed. The younger travellers have salmon with cornflakes which they love. It’s a recipe I found online years ago when they were tiny, I think it may have even been a weight watchers menu. You baste the salmon with a dollop of butter, seeded mustard, and a few spoonfuls of honey, and then coat it with crushed cornflakes. The kids think it’s fantastic. Monday is Green Chicken Curry, I’ve used the same menu for about 100 years, pre G. When the little travellers were really little I made it with a tiny bit of curry paste and as they’ve got bigger, the quantity of curry paste has increased. I throw in eggplant/aubergine, zucchini/courgette and broccoli. They also like it with bamboo shoots. Tuesday is Beef Strogonoff. We ask Margaret what she would do when it comes to strog. She’s never let us down. Wednesday is Soto Ayam. This is where Henry Hotdog has excelled, he doesn’t actually like Soto Ayam but says he’s going to have left over strog that day. He put Soto Ayam on the menu after his big brother made a request. I know? I’m waiting for the first fight of the week to see if there’s a move to remove it. Thursday night is Tacos. I cannot stand Tacos but the adults in this house are happy to have wine and a cheese platter with yummy bread for dinner on Thursday nights after the little travellers have gone to bed. G’s office is quite close to Monoprix which has a fantastic cheese section. Friday night is a surprise, in other words, G and I are out and we’ll probably make something really simple for the kids before we go.